Apple has started the beta versions of iOS 12.1. Here today we have iOS 12.1 beta 2 ipsw firmware which you can install on your iPhone, iPad or iPod without needing any apple developer account or UDID. This method can be done on PC using itunes. iOS 12.1 beta 2 is the latest release and comes with few improvements. Direct iOS 12.1 Beta 2 ipsw links can be found below in this post. There are step by step instructions given to install the firmware and you need no developer account for this. iOS 12.1 beta has all the same features that were in iOS 12. All the major software improvements are already done in iOS 12 update so this iOS 12.1 is update only brings a few necessary features, not some major upgrades. Following features and upgrades are available in iOS 12.1 Beta 2 ipsw. 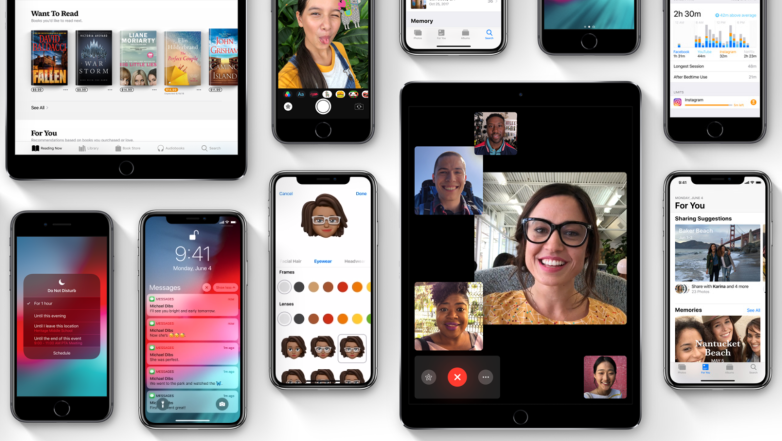 The very first and important upgrade in iOS 12.1 is Group Facetime. You can facetime with upto 32 participants at the same time in a Group. This features was previously available in the very first iOS 12 beta update but then it was put down. Not it is reintroduced again. iPad pro models will received an enhancement in Face ID. It will work in landscape mode in iOS 12.1. In camera portrait mode, real time preview of depth control is added. Below are the download links of iOS 12.1 Beta 2 ipsw files. Get the firmware file compatible with your phone model. Direct iPSW download link are available below. You can download the required iOS 12 Beta 2 for iPhone from here. For iPod iOS 12 Beta 2 files are below. To install the latest iOS 12.1 beta 2 update. Follow the below instructions. First download ipsw file for your phone mode. Now open itunes and connect your iphone, ipad or ipod to the computer. Note: Backup your data before updating. On itunes, click on the small Device icon on the top left. Now if you are on Windows, hold “Shift” key and click on Check for Update option. If you are on Mac, hold “Options” key and click on Check for Update. A pop up will appear asking you to select the iOS 12 beta 2 ipsw file. Navigate to the file, and select it. Update the phone. Now the beta version of iOS 12.1 Beta 2 will start installing on your phone. Wait for it to install completely. When the firmware installs, your phone will reboot. Disconnect the phone from computer when homescreen shows up. That is it. If you are having any issues installing iOS 12.1 beta 2 iPSW for iPhone, iPad or iPod then do comment below. Subscribe and share.